Snow surrounds the Town Hall in the town of Michelstadt, Germany, Europe. 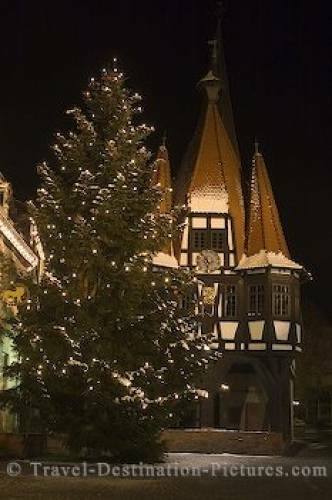 The ancient town of Michelstadt in Germany is hosting one of the best known regional christmas markets. While during these markets the crowds make it next to impossible to get serious pictures of this maginficent scenery, the time between christmas and new years eve provides the same celebratory decorated town but without the crowds and without the market stands. town of Michelstadt, Germany, Europe.